Clear heads that work well with dampening and can be lettered.. The bass model is a single ply head. Bass sizes are available in all sizes including 24, 26, 28".. This head is also available in black, clear white gloss..
Clear heads that work well with dampening and can be lettered.. The bass model is a single ply head. Bass sizes are available in all sizes including 24, 26, 28".. This head is also available in black, clear, and white gloss. Aquarian Super Kick 1 24"
The Super Kick Series head includes dampening built into the design. We also offer exclusive Super Kick I tenor heads with hoops designed to work with wood hoop drums. This head provides a clear and projecting tone. This head is available in all popular bass sizes including 24, 26 and 28", plus custom sizes. 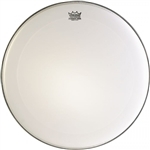 Aquarian Super Kick 1 26"
Aquarian Super Kick 1 28"
Self-dampened bass drum head that features a free-floating internal muffl' ring to eliminate over-ring and conflicting tones for the pipeband drummer seeking the best in definite pitch tuning. This head is available in white and is sized for a 24" bass shell.